For other uses, see Carlos Delgado (disambiguation). Carlos Juan Delgado Hernández (born June 25, 1972) is a Puerto Rican former professional baseball player. With 473 home runs and 1,512 RBI, he holds the all-time home run and RBI records among Puerto Rican players. He is one of only six players in Major League history to hit 30 home runs in ten consecutive seasons, becoming the fourth player to do so. During his twelve years with the Toronto Blue Jays, Delgado set many team records, including home runs (336), RBI (1,058), walks (827), slugging percentage (.556), OPS (.949), runs (889), total bases (2,786), doubles (343), runs created (1,077), extra base hits (690), times on base (2,362), hit by pitch (122), intentional walks (128) and at bats per home run (14.9). Delgado also played for the Florida Marlins and New York Mets. On February 4, 2015, Delgado was elected to the Canadian Baseball Hall of Fame. Delgado was born in Aguadilla, Puerto Rico to Carlos "Cao" Delgado and Carmen Digna Hérnandez. He grew up in the El Prado section of Aguadilla. There, he attended elementary school alongside his three siblings. Both his father, "Don Cao", and his grandfather, Asdrúbal "Pingolo" Delgado, were well-known figures in the town. Delgado has said that this made him feel "protected", but that it also demanded that he had to behave properly. Delgado attended Agustín Stahl Middle School and José de Diego High School, from which he graduated in 1989. Delgado has expressed his strong feelings of pride in being an Aguadillano, noting everything he holds dear is found in the municipality, and his off-season house is located there. He developed friendships with several of the town's inhabitants, with whom he began playing baseball in the little leagues. Carlos Delgado is a member of the Toronto Blue Jays' Level of Excellence. At the age of 16, several major league organizations including the Cincinnati Reds, Montreal Expos, New York Mets, Texas Rangers and Toronto Blue Jays saw his potential and attempted to sign him. He signed with the Blue Jays in 1988 after being discovered by team scout Epy Guerrero. After being named the #4 prospect in the minor leagues by Baseball America, he made his major league debut with the team during the 1993 season. Though he didn't play in the 1993 World Series, he was awarded a World Series ring. Originally a catcher, he later switched to first base (after an experiment with the Jays placing him in left field failed) and became one of the most productive sluggers in the major leagues. A two-time All-Star, in 2000 and 2003, Delgado holds several Blue Jays single-season and career records. He won the Hank Aaron and The Sporting News' Player of the Year Awards in 2000, and the Silver Slugger Award in 1999, 2000, and 2003. In 1999, Delgado hit a career-high 44 home runs, along with 134 RBI, and a .272 batting average. The next year, he batted a career-high .344, along with 41 home runs, 57 doubles, and 137 RBI. He finished fourth in the 2000 American League MVP voting. On September 25, 2003, in a game against the Tampa Bay Devil Rays, Delgado became the 15th major league player to hit four home runs in one game. He hit a three-run home run in the first inning off Jorge Sosa, then again off Sosa while leading off the fourth off, then off Joe Kennedy while leading off in the sixth and then off Lance Carter leading off the eighth inning. Delgado is the only player to hit four home runs with only 4 at-bats in a game. In the 2003 season, Delgado hit 42 home runs and led the Majors with 145 RBI, while batting .302; he finished second to Alex Rodriguez for the AL MVP Award. He was named AL Player of the Week on September 30, 2003 and again on September 7, 2004. Following the 2004 season, Delgado became a free agent, and was pursued by the Baltimore Orioles, Florida Marlins, New York Mets, Seattle Mariners and Texas Rangers. The Blue Jays were not interested in re-signing him, due to payroll constraints. On January 25, 2005 Delgado chose to sign with the Marlins, signing a four-year contract worth a reported $52 million. He made a successful transition to the National League, with a .301 batting average, .399 on-base percentage, 33 home runs, and 115 RBI in 2005. At the same time, he shared the major league lead in errors for a first baseman, with 14. Following the 2005 season, the Marlins performed one of their periodic salary-cutting maneuvers. In the "market correction", they unloaded some of their higher paid players. On November 23, 2005, the Marlins sent Delgado and $7 million to the New York Mets for Mike Jacobs, Yusmeiro Petit and Grant Psomas. Delgado responded well as the feared cleanup hitter for the Mets, hitting 38 home runs and driving in 114 runs throughout 2006. With Delgado hitting between fellow Puerto Rican Carlos Beltrán and star third baseman David Wright, the Mets had the best record in the National League in 2006, but lost to the St. Louis Cardinals in the National League Championship Series, 4–3. At season's end, with 407, Delgado was tied with Duke Snider for 41st place for career home runs. Through 2006, Delgado was the all-time leader for interleague play RBIs with 131, and second all-time in home runs with 43. Carlos Delgado had early struggles in the 2007 season, with his batting average falling below .200 in April, but his numbers improved as the season progressed. On May 9, 2007, he hit a home run into McCovey Cove during a game against the San Francisco Giants, becoming the first visiting player to have hit three splash home runs at AT&T Park. Delgado ended the season tied with Cal Ripken, Jr. for 37th place on the all-time career home run list with 431. During spring training 2008, Delgado was diagnosed with a hip impingement, however, the Mets decided to keep him on the active roster. As in the previous year, Delgado began the season in an offensive slump with a .204 batting average in April, and hitting just three home runs, but once again his stats improved as the season continued. In May, his batting average increased to .235 with five home runs. On June 15, 2008, Delgado broke Juan González's record for most runs batted in by a Puerto Rican player. On June 27, Delgado set a new Mets record with 9 RBIs (hitting a two-run double, grand slam, and three-run home run) in an interleague game versus the New York Yankees, breaking Dave Kingman's club record of 8. In the final game before the All-Star break, Delgado hit his 17th home run of the season. Between June and July his batting average improved, rising to .260 with 19 home runs. Between July 23–31, Delgado hit four home runs. On August 21, 2008 against the Atlanta Braves, Delgado went 5 for 5 with 3 singles, 3 RBIs, a double, and a walk-off single scoring David Wright in the ninth off the glove of left fielder Omar Infante. It was the first time he had gone 5 for 5 in 10 years. The Mets swept the three-game set. 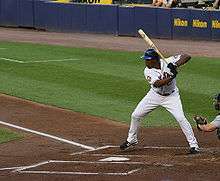 On August 25, 2008 against the Houston Astros, Delgado fired two 3-run homers to lead the Mets to a 9–1 victory in the finale of the series. On September 7 he became the third Mets player in history to have at least 65 RBIs in a 65-game stretch in a season. On September 9, he tied Dave Kingman's record of most multi-home run games during a season as a Met with 7. Delgado notched his 2,000th career hit on September 21, 2008 against the Atlanta Braves. On October 31 the Mets exercised Delgado's $12 million option. Delgado was ninth in the voting for the 2008 National League MVP Award, behind Albert Pujols, Ryan Howard, Ryan Braun, Manny Ramirez, Lance Berkman, CC Sabathia, David Wright and Brad Lidge. Delgado was the first Major League player to hit a home run into the Pepsi Porch at Citi Field on April 8, 2009. He played his last major league game against the Pittsburgh Pirates on May 10, 2009. Eight days later on May 18, the Mets announced that Delgado had a bone spur and a torn labrum in his hip, and he would have to undergo surgery. The Mets reported the next day that the surgery was successful and Delgado would be out for approximately ten weeks, which would delay his quest for 500 home runs. However, he did not play again in 2009. Delgado filed for free agency on November 5. Delgado made his return to the Puerto Rico Baseball League (PRBL) for the 2009 season, registering a batting average of .364 and one home run in his first three games. In February 2010, Delgado underwent another hip operation, this time to reconstruct the labrum on his right hip; he also underwent a micro-fracture procedure on his hip socket. Although Delgado had reportedly received interest from Major League clubs (including the Mets and Florida Marlins), he felt pain in his hip and decided to undergo the second surgery to be better prepared for the coming season. According to his agent, David Sloane, Delgado "felt, despite the time it would take, it was a better option for him to be the Carlos Delgado of old instead of an old Carlos Delgado." On August 7, 2010, the Boston Red Sox signed Delgado to a minor league contract. He played 5 games with the triple-A Pawtucket Red Sox between August 9 and 15, collecting 3 singles in 13 at-bats (.231, 0 HR, 2 RBI). This was the entire extent of Delgado's 2010 season after Delgado suffered a setback with his surgically repaired hip. On April 13, 2011, Delgado officially announced, while in San Juan, Puerto Rico, his retirement from professional baseball after 17 years in Major League Baseball. On December 7, 2012, the Toronto Blue Jays announced that Delgado would become the 10th person inducted to the club's Level of Excellence. The induction occurred on July 21, 2013 at the Rogers Centre in Toronto. Delgado also threw the ceremonial first pitch for that day's game, with the Toronto Blue Jays playing against the Tampa Bay Rays. After retiring, Delgado has continued to work in matters closely related to baseball. In February 2013, he was announced as the new member of the Board for the Development of the Puerto Rican Full-Time Athlete. This agency is directed by the Department of Sports and Recreation of Puerto Rico. Also, in March 2013, he served as hitting coach for the Puerto Rico national baseball team that represented the island at the 2013 World Baseball Classic. The team finished second in the rankings. In his only appearance on the Baseball Hall of Fame ballot in 2015, Delgado received just 3.8% of the vote, below the 5% minimum required to remain on future ballots. That same year, he was elected to the Canadian Baseball Hall of Fame. Delgado lives in his hometown of Aguadilla, Puerto Rico. He is married to Betzaida García, who is also from Aguadilla. They have a son, Carlos Antonio, and in 2010 adopted a baby daughter, Mariana Isabel. Like his hero, Delgado is a well-known peace activist, and has been open about his political beliefs. As part of the Navy-Vieques protests, Delgado was actively opposed to the use of the island of Vieques, Puerto Rico as a bombing target practice facility by the United States Department of Defense, until bombing was halted in 2003. He is also against the occupation of Iraq. In the 2004 season, Delgado protested the war by silently staying in the dugout during the playing of "God Bless America" during the seventh inning stretch. Delgado does not make a public show of his beliefs, and even his teammates were not aware of his views until a story was published in July 2004 in the Toronto Star. Delgado was quoted as saying "It's a very terrible thing that happened on September 11. It's (also) a terrible thing that happened in Afghanistan and Iraq, ... I just feel so sad for the families that lost relatives and loved ones in the war. But I think it's the stupidest war ever." The story was the subject of a media frenzy, mostly in New York, where on July 21, 2004, as was anticipated, Delgado was booed by Yankee fans for his passive protest during a game at Yankee Stadium. Delgado had explained that the playing of "God Bless America" had come to be equated with a war in which he didn't believe. In a New York Times interview, Delgado said this is what he believed in, and "It takes a man to stand up for what he believes." After being traded to the Mets, in a conciliatory measure, Delgado opted to stand during the singing of "God Bless America." Among other charity work, Delgado is well known for his generous visits to hospitals in his hometown where, on Three Kings Day, he brings toys to hospitalized children. In 2006, he joined Puerto Rico's Senate President in co-sponsoring a massive Three Kings gift-giving effort in the town of Loíza. Delgado started his own non-profit organization, "Extra Bases" to assist island youth. In 2007, Delgado donated video conference equipment to allow his hometown's Buen Samaritano Hospital to establish a regular link with a hospital in Boston in order to allow for remote diagnoses through telemedicine. Delgado has also contributed to improving Puerto Rico's public education system. In 2007, he participated in "Sapientis Week", an initiative sponsored by the non-profit Sapientis which brings distinguished public figures into classrooms in order to raise the public's awareness of the education crisis in Puerto Rico. Delgado taught a class on Athletic Mental Training and Health at the Ramon Power y Giralt School in the Luis Llorens Torres public housing complex. For his efforts, Delgado was awarded the Roberto Clemente Award in 2006. The award goes to the player in baseball who best exemplifies humanitarianism and sportsmanship, and was named after Hall of Famer Roberto Clemente in 1973. Prior to the 2008 season of the Puerto Rico Baseball League, Delgado was involved in an initiative to provide economic help to the Indios de Mayagüez team. ↑ Chisholm, Gregor (February 4, 2015). "Delgado, Stairs highlight '15 Canadian Hall class". MLB.com. Retrieved February 4, 2015. 1 2 3 4 5 6 7 Luis Santiago Arce (2007-09-19). "Deportes". Aguadillano de pura cepa: Apegado a sus raíces (in Spanish). Puerto Rico: El Nuevo Día. p. 119. 1 2 Carlos Delgado Statistics and History Baseball-Reference.com. Accessed on March 5, 2012. ↑ Carlos Delgado Minor League Statistics & History Baseball-Reference.com. Accessed on January 8, 2013. ↑ Pouliot, Matthew (April 13, 2011). "Carlos Delgado: MLB's best two-time All-Star". hardballtalk.nbcsports.com. Retrieved August 12, 2015. ↑ Tourtellotte, Shane. "Holland and Granderson". TheHardballTimes.com. Retrieved 6 May 2012. ↑ "Toronto's Carlos Delgado named American League Pepsi Player of the Week". 2003-09-30. Retrieved 2007-05-27. ↑ "Toronto's Carlos Delgado named American League Player of the Week". 2004-09-07. Retrieved 2007-05-27. ↑ Delgado chooses Marlins Archived March 10, 2005, at the Wayback Machine. ↑ "¡Otra gesta para Delgado!" (in Spanish). Primera Hora. 2008-06-16. Retrieved 2008-06-17. ↑ "Delgado tuvo una tarde bestial" (in Spanish). Primera Hora. 2008-06-28. Retrieved 2008-06-28. ↑ "Mets siguen imparables" (in Spanish). Primera Hora. 2008-07-14. Retrieved 2008-07-14. ↑ Lester Jiménez (2008-07-23). "Las cosas han caído en su sitio". Primera Hora. Retrieved 2008-07-31. ↑ "Delgado sigue su verano caliente" (in Spanish). Primera Hora. 2008-07-25. Retrieved 2008-07-31. ↑ "Enorme despertar" (in Spanish). Primera Hora. 2008-07-26. Retrieved 2008-07-31. ↑ "Demasiado Delgado" (in Spanish). Primera Hora. 2008-07-30. Retrieved 2008-07-31. ↑ Botte, Peter (August 25, 2008). "Mike Pelfrey's 2nd straight complete game helps Mets cruise past Astros". Daily News. New York. ↑ Shpigel, Ben (November 1, 2008). "Mets, Wasting No Time, Secure Delgado for 2009". The New York Times. Retrieved April 1, 2010. ↑ Carlos Delgado Files For Free Agency, Will He Be Back in 2010? ↑ Noel Piñeiro Planas. "Deportes". Por Buen Camino Carlos Delgado. El Nuevo Dia (in Spanish). Puerto Rico. ↑ Rosenthal, Ken. "Agent: Delgado has hip surgery again," Fox Sports (Feb. 20, 2010). ↑ "Archived copy". Archived from the original on 2010-08-07. Retrieved 2010-08-07. ↑ "Carlos Delgado to be inducted on Blue Jays' Level of Excellence". The Globe and Mail. Toronto. December 7, 2012. ↑ "Carlos Delgado es parte de la Junta para el Desarrollo del Atleta". El Nuevo Día. February 13, 2013. ↑ Mejías, Marcos (March 5, 2013). "Pompeao Carlos Delgado". El Nuevo Día. Archived from the original on 2013-03-10. ↑ "The Hutch Award, Lou Gehrig Award, Babe Ruth Award & Roberto Clemente Award Winners". Baseball-Reference.com. Retrieved February 21, 2015. ↑ "Delgado tendrá la carta de garantía que solicitó". Primera Hora (in Spanish). 2008-06-25. Retrieved 2008-06-27. Wikimedia Commons has media related to Carlos Delgado.